Music videos can provide additional value to the artistic expression of the song. They’re also important brand assets to communicate to fans the culture and identity of a band. A great video is a luxury for an artist, independent or otherwise. Dihex is our eighth which is a lot from a New Zealand act with three album releases. For me, this video is an achievement in execution. This is how we did it. A label representative in Australia once told me that they had made music videos for as little as $200 that had had "just as significant impact in the market" as a $5,000 video. Without providing the data to support the statement, it seemed questionable. NZ On Air enabled this video. Through the Making Tracks scheme which was introduced in 2011, we have been fortunate to receive three rounds of funding to date. Without NZ On Air’s sponsorship, Shinkansen and Helix might not have been completed with the production value we envisioned. Dihex wouldn’t have been made at all. Between 2008 and 2010, we self-financed four music videos. At the time, the generally accepted budget for a professional video production was $5,000 NZD — the capital provided by NZ On Air under the previous funding scheme. For recipients or any band pursuing a quality result independently, delivering on that budget was a challenge that still required trading in favours. The Caddick Report (2010) noted that audience expectations have grown. You can’t make a world-class video for $5,000: "Given that the amount of the grant from NZ On Air’s point of view has not changed in 19 years this would be equivalent to $7,500 today allowing for inflation." However, without a presence on radio or much of a local scene for our style of music, at the time we felt videos would be a critical marketing investment for coveted evening broadcasting and digital channels. You can’t make a world-class video for $5,000 NZD. Lacking a network and some commercial acumen, we worked with the recommended suppliers and paid at least $5,000 plus tax per project (pro tip: incorporate your band early, talk to an accountant about GST refunds and asset depreciation). Later, we collaborated with friends to produce videos at $1,500–2,000. Notwithstanding the resourcefulness, innovation and authenticity that financial limitations can inspire, we had mixed creative experiences because of our immaturity with the medium and industry. Making Tracks commits $6,900 (including GST) of a total $8,900 video budget; the GST exempt balance is provided by the artist or label. Here’s the budget for our latest project. 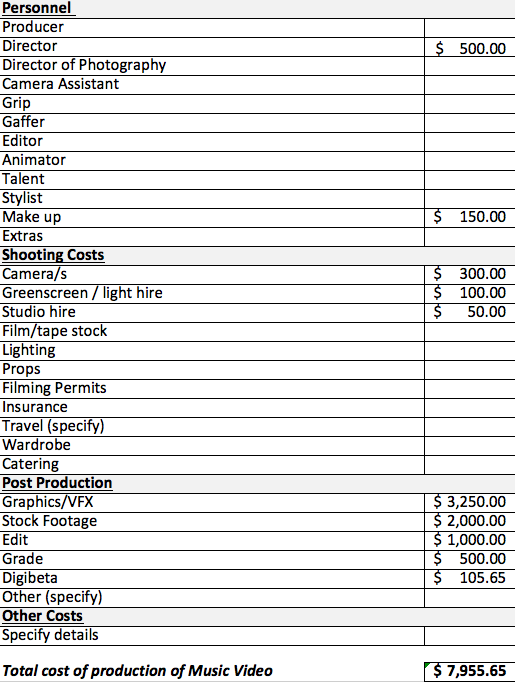 While not a particularly complex production, the spreadsheet does outline the many potential costs in personnel, shooting and post-production expense categories. Although such a budget sounds like a lot to play with, it can quickly be exhausted by a location shoot, a RED camera rental, or VFX sequences. For example, to make the finances for Shinkansen and Helix work, the director and producers opted to take no fees for the former and very modest sums for the latter. We’re all very proud of those videos. We had some challenges at the outset: logistics and self-imposed creative limitations. The band is currently dispersed across New Zealand and Australia. We also wanted to avoid another “performance video” treatment. To save time and cost, we had to be focused, lean and execute quickly. We concentrated on what we had immediate access to. We also planned a collaborative workflow that improved manageability of tasks to ensure on-time delivery. Dihex stemmed from something of a concept album inspired by light sculpture and sci-fi cinema. This offered us a broad visual palette. We wanted to extend the thematic framework of code, pattern recognition and design as means of expression — previously explored in Helix — in a unique way. Director Jared Kahi and I also wanted to push the VFX further this time with abstract geometry; not just a motif but characters in a story. We imagined the setting as virtual reality New Zealand landscapes; cold, dissonant but stunning. The allusions in the lyrics gave us a clear mandate. As such, we were able to quickly conceptualise an authentic treatment. This felt like an immediate success, compared to the challenge of outsourcing the creative brief. Without the skills to produce videos ourselves, we had previously found ourselves in a "take it or leave it" scenario with the results suppliers returned. For a work like 11811, our priority had to be relevant video content that enhanced the experience of the album. We knew the material intimately. Narrative music videos are difficult to pull off. We learnt this lesson with Monster in a Pretty Dress. Although there were compelling reasons for that experiment, the risk of committing the entire treatment to dramatic storytelling can be the lack of visual diversity. While The Chemical Brothers nail this, on a budget production, it helps to have at least 20% of screen time as performance content to hold the audience’s attention — especially for rock music. Experience told us we needed a balanced treatment of three core elements: narrative, performance and something other. The geometrics objects interacting with VFX landscapes provided the narrative component. We also had an archive of unreleased live footage from our 2013 tour to South Africa; shot on a single GoPro across seven performances. 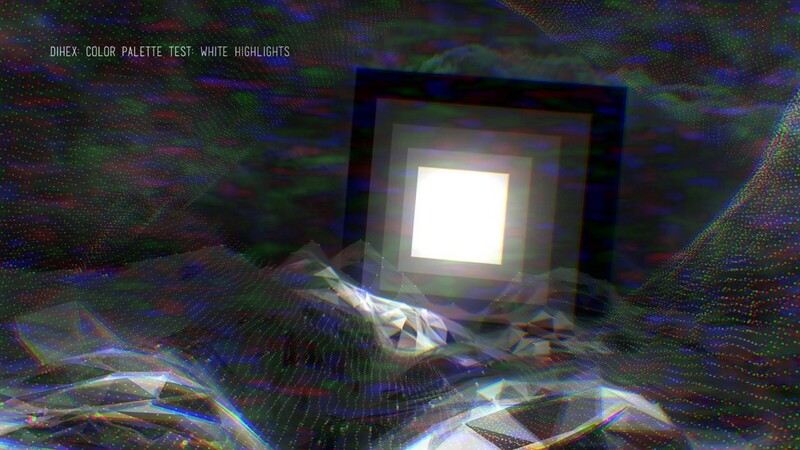 Jared and I had previously drafted a treatment for another track that involved CCTV-style footage; a reference to other album themes of surveillance and VR. The odd, voyeuristic angles of the shows were distinct from the more staged, compositional performance shots of our previous music videos. It was also a practical solution to featuring the whole band while avoiding the cost of flying everyone back to New Zealand for a shoot. Instead, we were able to channel the budget into the landscape footage and VFX we wanted. We needed a balanced treatment of three core elements: narrative, performance and something other. 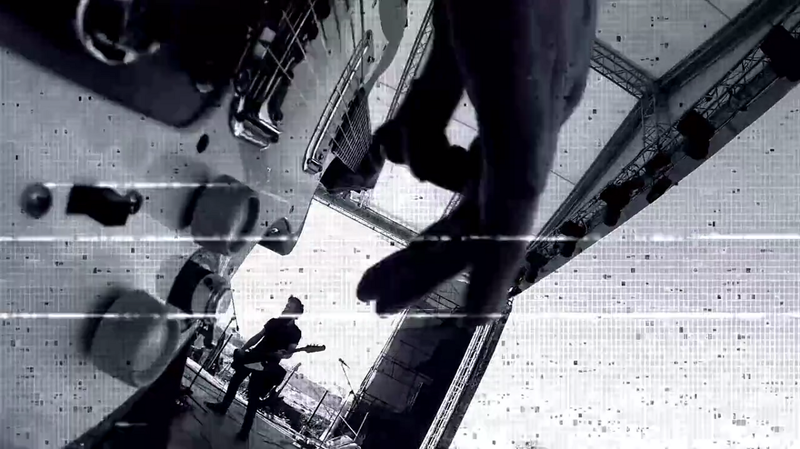 The third component of the video was an intimate vocal performance, heavily treated with textural effects to connect it aesthetically with the rest of the brief. This lifted the overall quota of performance material but was considered a standalone component for balanced visual storytelling: dramatic plot, band performance and soliloquy. Given the modest shooting costs for the sequence, it was also quick and easy to capture one night after work in a space run by the director’s friend. For me, the “narrative, performance, other” formula is what made a video like Shinkansen compelling even at nearly double the length of Dihex. While the weighting was different, the treatment was fundamentally: drama, band performance (traditional “performance video” approach), and creative (macro photography with analogue VHS distortion). Similarly for Dihex, we needed three major pieces to create the diversity, tension and release to maintain an immersive quality throughout. To deliver the project successfully, we employed free web/mobile apps to facilitate good communication and accountability. These tools streamlined how we iterated, got consensus and assigned responsibility for tasks. Importantly, they removed the need for email altogether. If you’ve ever tried to manage mixing an album via email, creative discussions quickly become unwieldy threads where things easily fall through the cracks. Over the month before pre-production started in earnest, we built up a mood board that captured the tonal and stylistic qualities of the treatment. 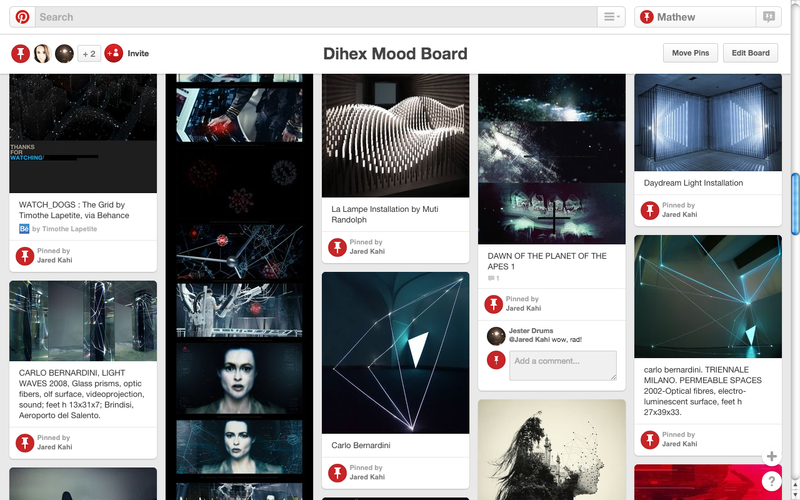 We used Pinterest as a tool to collate material we found from active searching and passive browsing. Creating a secret pinboard for project members to share content enabled us to quickly visualise the treatment. Collaborating with Pinterest was particularly useful in the following ways. It was simple to source reference material into a centralised collection that was accessible by anyone, anywhere. It helped the remote band members to feel involved and reassured everyone of the treatment. 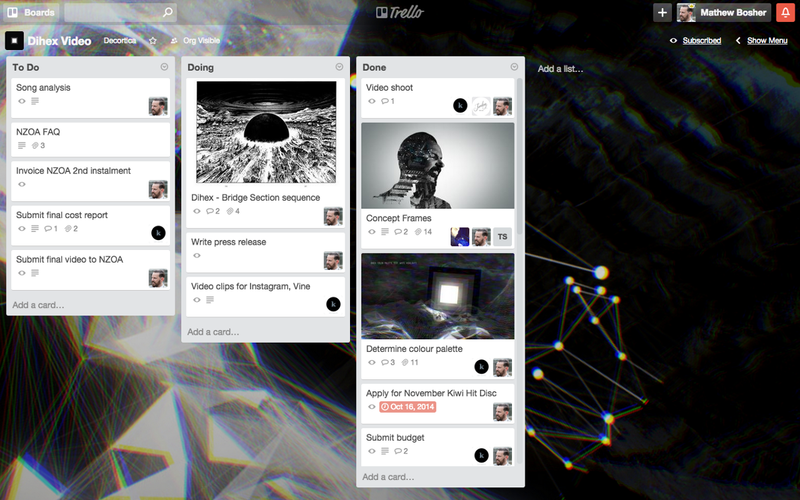 For project management, we used Trello. This collaborative workflow tool is a fundamental part of our band’s strategic planning and day-to-day operations. We have Trello boards for songwriting, touring, marketing and accounting. Visual management provides a real-time update on tasks and the overall status of a project. At a glance, Trello is easy to understand and push notifications keep subscribers to the board across all new activity. An intuitive product, these were the key benefits for our video. People could look at the status of the card (task) and read further comments therein. There was no time wasted with messages back and forth on platforms that not everyone routinely checked. This enabled us to quickly take corrective action. For example, while it was far more exciting to manage the creative tasks, our accounting and reporting responsibilities to NZ On Air had to be completed in order to release the video to the world. I was able to maintain my focus on the necessary administration in the To Do list, assigning due date reminders to prompt me if necessary. Few freemium tools are so generous with the functionality offered at no cost. Trello could squeeze users on board member size, list number or locking the mobile app but doesn’t (for now). This is an absolute gift for creative teams — particular musicians on a budget. Provided you have the capital investment, the most critical things in producing music videos are 1) a productive relationship with the right partner (ideally with multidisciplinary talents) and 2) a lean mindset. Thanks primarily to NZ On Air, Dihex worked because we concentrated on what we knew, collaboration and simplification. This helped us manage the fine balance between achieving a great creative brief, on-time delivery and financial pragmatism to produce an asset that best served the artist. What tips to do you have for making music videos? I’d love to hear about them. Listen to the album "11811" by Decortica.